Dr. Beers will describe several key initiatives of the DC Collaborative for Mental Health in Pediatric Primary Care and discuss how taking a health network approach to this complex issue improves outcomes and provides community benefit. 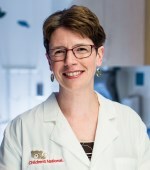 Lee Ann Savio Beers, MD, is Associate Professor of Pediatrics and the Medical Director for Municipal and Regional Affairs within Children’s National’s Goldberg Center for Community Pediatric Health and Child Health Advocacy Institute. She is also the Director of the DC Mental Health Access in Pediatrics (DC MAP) program and Co-Director of the Early Childhood Innovation Network. She oversees the DC Collaborative for Mental Health in Pediatric Primary Care, a public-private coalition that serves as a catalyst to elevate the standard of mental health care for every young person in the city by increasing primary care provider capacity and achieving systemic policy change. She earned her Medical Degree from Emory University School of Medicine and completed a pediatric residency at the Naval Medical Center in Portsmouth VA. Prior to joining Children’s National, she was a general pediatrician at the Naval Hospital in Guantanamo Bay, Cuba and the National Naval Medical Center in Bethesda, MD. Non-Members: To view the webinar archive, register for a free guest account by clicking on the orange button below. Don’t see the slides and video below? You’re probably not logged in. Non-members: To view the webinar archive, register for a free guest account by clicking here.